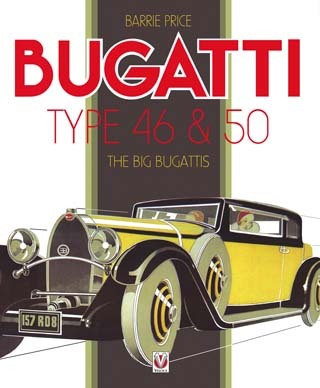 Bugatti Type 46 & 50: The Big Bugattis by Barrie Price – Book Review. Richard Barnett on the iconic 'Big Bugattis' - a car fan's dream motor? Bar the ultra-rare and ultra-luxurious Royale, Bugatti’s other serious stab at the luxury car market came in the form of the Type 46 and 50 models. Originally seen as filling the gargantuan chasm between the smaller, three-litre Type 44 and the 12.7-litre Royale, the 46 brought the typical Bugatti attention to detail, although author Barrie Price highlights what could have been the car’s shortcoming – a complex gearbox arrangement that created mechanical complexity where it wasn’t needed. The 46’s 5.3-litre engine provided plenty of power, but for those who didn’t think that was enough, Bugatti introduced a supercharged model, known as the 46S. But never one to stand still, the 46 was superseded by the Type 50, which aped the design used by Harry Miller in the USA. This saw a hemispherical combustion chamber for greater power extraction and twin camshafts, and with all Type 50 engines leaving the factory with a standard-fit supercharger, 200 brake horsepower was claimed – sufficient to allow relaxed high-speed driving to Deauville for the racing or Monte Carlo for the casino. Unashamedly targeted at the wealthy, the 46 and the 50 have always been notable for their bodywork designs, where flamboyance might have been thought the norm, but not all wealthy owners wanted the attention-grabbing looks some coachbuilders favoured. Those designs are what make this book: While the author does a first-class job in explaining the car’s history (the reminiscences from one owner, who bought his 50 in the late 1960s are especially fascinating) and succeeds in making the technical aspects interesting, the images – and especially those when these cars were new – are what makes this work so fascinating. Non-Bugatti cognoscenti will not be surprised by the number of open models depicted, but what appeals (and appals?) is the appearance of one or two models, where one questions both the coachbuilder’s and the buyer’s tastes. Nevertheless, those buyers were surely happy with their lot. When it comes to the saloons, however, there are plenty of beauties, and very few duds. Whisper it, but almost all the saloons, irrespective of who designed and built the coachwork, were streets ahead of those performing a similar role for Bentley and Rolls-Royce. Some were undoubtedly frumpy, some truly bizarre, but most of the saloons were exquisite or imposing, with an effect that still rings true today. This is a fabulous book both in terms of writing and in illustration. At last the Type 46 and the Type 50 have gained some long-overdue recognition.